Thank you to Cost Plus World Market for generally being awesome and for sponsoring this post. Backyard Getaway ... first things first. Here is a before shot. Who doesn't love a good before and after shot. Scroll down for the after shot from this angle. 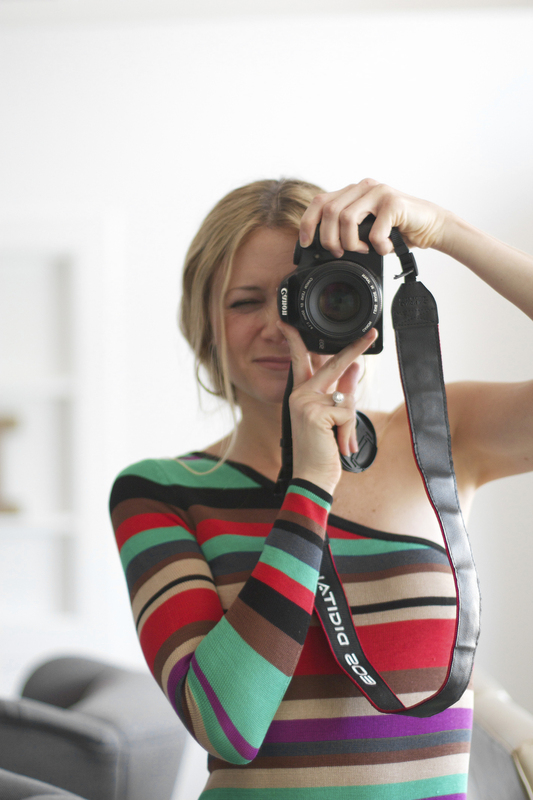 Having a new baby is absolutely magical, but it can be hard too. Sleepless nights can have you feeling depleted, and you find yourself spending a lot more time at home. While I would love to have a date night with Mikes every week, it's just not possible during this newborn stage. Something we try to do instead is create "date nights" at home when the babies are finally asleep. I recently overhauled our back patio with these date nights in mind. I wanted to create a space for us that feels like a romantic backyard getaway. Here is the full reveal along with some tips and tricks for decorating outdoors. I hope you like it! The key to outdoor decor is to make it feel like an extension of your interior. To ground your patio and make the space feel more like it's indoors, start with an area rug. I am obsessed with this Black Graphic Woven Emerson Rug . The colors are neutral, but you still get a bit of pop with the pattern. 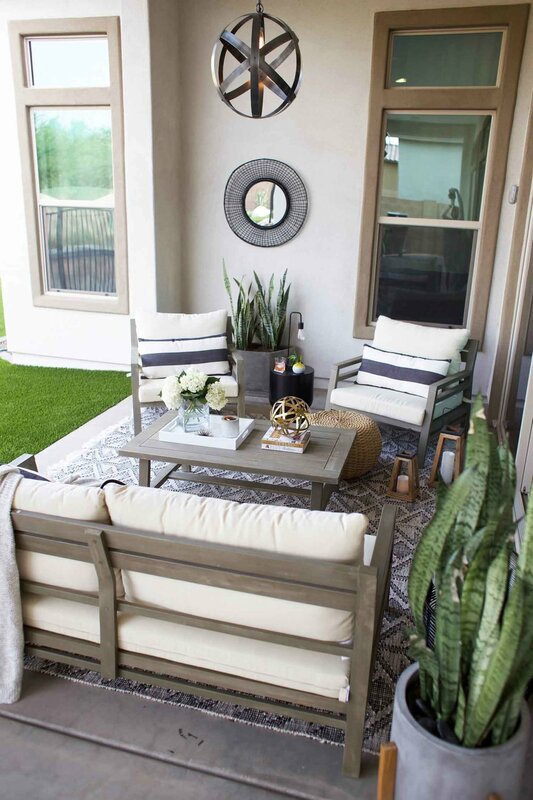 After you have laid down your rug, you will need to add some outdoor furniture right? Cost Plus World Market is my hero for creating this Gray San Sebastian Outdoor Occasional Collection . The scale of it screams thousands of dollars, but it is so affordable. I like to go neutral with my furniture, and I add pops of color, textures, and/or patterns with my accessories. The deep bench lives up to its name. It is deep and gloriously comfy. You can easily snuggle up to your honey on this thing without anyone worrying about falling off. I paired the bench with two San Sebastian Occasional Chairs. Even though it's not in the name, these are deep as well. Your guests will love them. I am normally not a furniture set type of person. I like to mix it up a bit. But I even went with the San Sebastian coffee table to match. When you add some accessories, this furniture set just doesn't feel like a set. Lighting is key to set the mood for a romantic backyard getaway. I suggest mixing "indoor" and outdoor lighting pieces to blur the lines between an indoor + outdoor space. I would call pendant lights and lamps traditionally indoor lighting pieces. 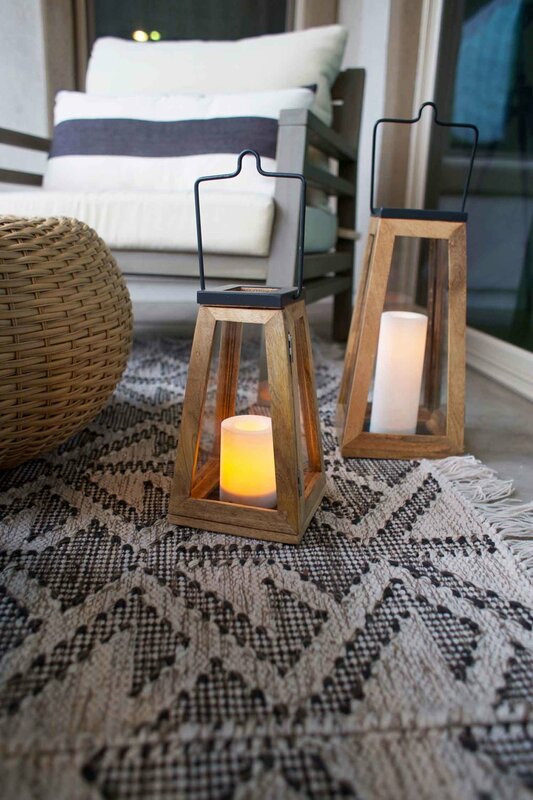 Hanging a pendant light and setting an outdoor lamp on a side table help make an outdoor space feel finished and cozy. 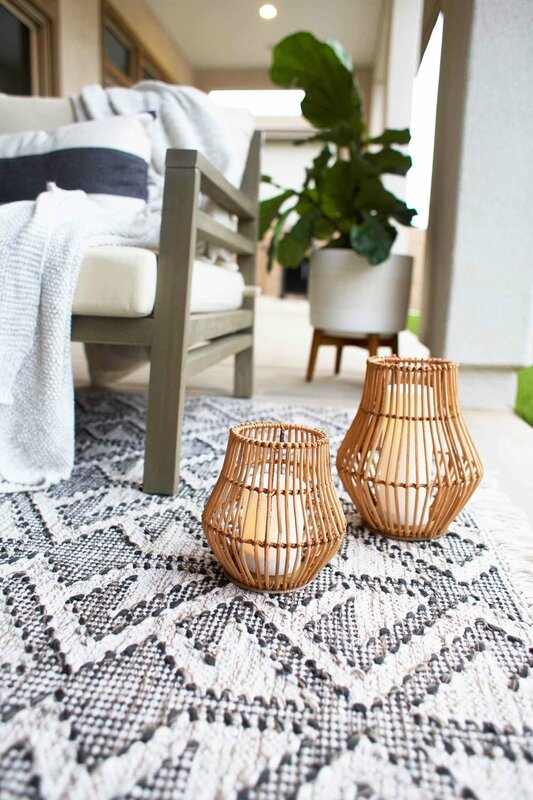 Adding in some outdoor lighting pieces like these Rattan Hurricane Candleholders help you dream of being somewhere exotic. Nothing brings the indoors out like a cozy blanket or fluffy pillow. Create texture and warmth in your outdoor space with plenty of textiles: blankets, pillows, and curtains. This Gray And Ivory Knit Sweater Throw is hands down one of the coziest throws I've ever felt. You will want to be right by your honey's side under this throw. Our curtains didn't make the shoot, but they are going up this weekend. I'll make sure to show you guys. 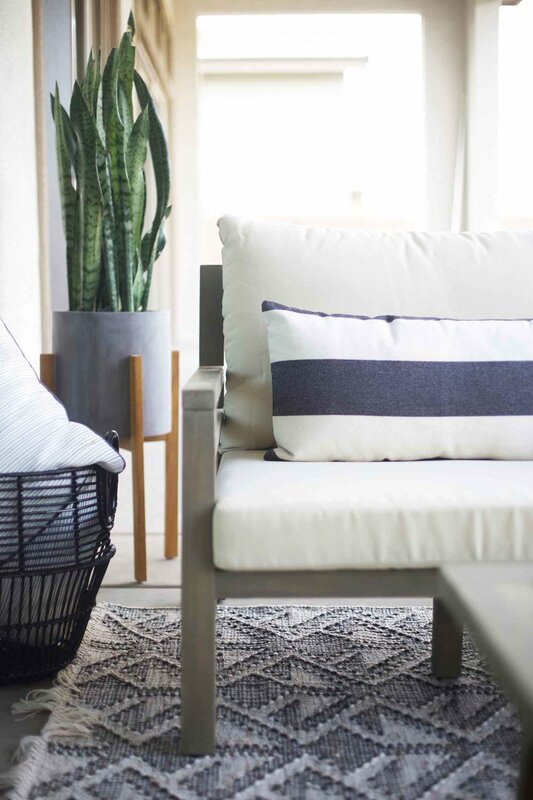 How much do you love these Black And White Striped Indoor Outdoor Pillows? I am at risk of putting these in every room in my house. I like to set plants with varying heights along the perimeter of an outdoor area to define the space and add life to the hard patio or deck surface. Plus, what makes you think of being on an exotic vacation more than some cool plant life. These snake plants are one of my current faves. They are an indoor plant but can survive outdoors in some climates. 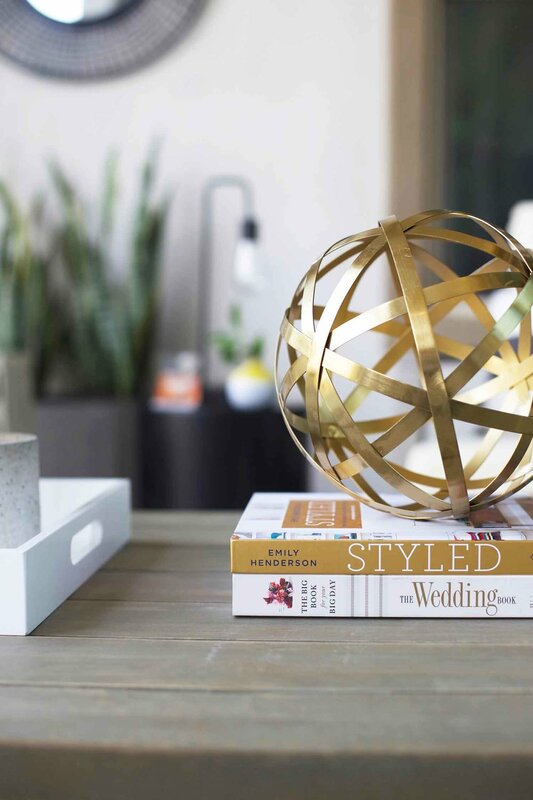 Nate Berkus says your space should feel "layered + collected over time." I feel like you can best do this with your accessories. My final tip is to add in pops of interest with accessories. For an outdoor coffee table, start with a Lacquer Serving Tray. This grounds your decor elements and adds horizontal interest. 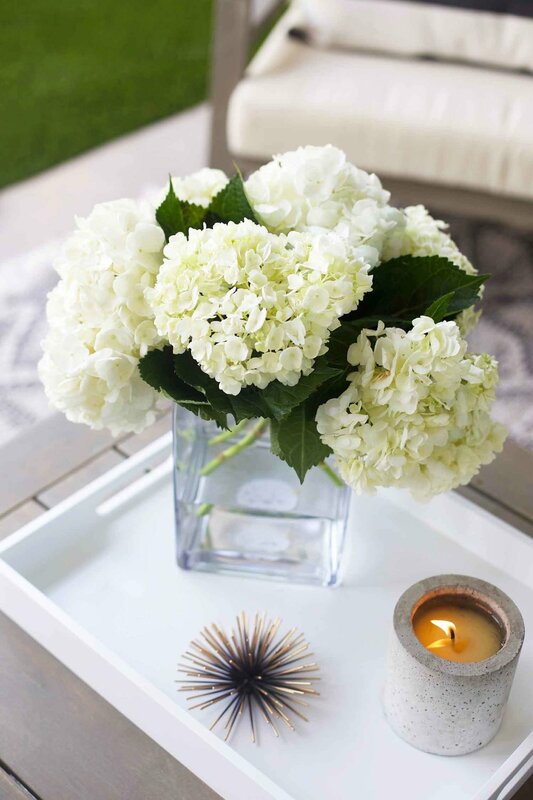 Decorate the tray with some fresh flowers in a vase like this clear square vase. Add in a candle and a sculptural object. On the other side of the coffee table place some books, the larger the better. Add an object or two on top. For an outdoor living space a basket of extra pillows is a useful + aesthetically pleasing touch. For your backyard getaway date night or a lil outdoor entertaining, I suggest serving a fun cocktail. Maybe recreate that ole signature cocktail you served at your wedding. I basically got everything I needed in store at the Gilbert Cost Plus World Market. You guys they are so awesome. I put together a shop this post section below, so you can see the sources for all of the items in one handy dandy spot. And here is Cost Plus World Market's store locator if you want to know where the closest store is to you. Instead of using real candles on the ground, which would melt in our 120º Arizona temperatures and would pose a safety hazard with our two babies, I used these outdoor led candles. They are an amazing alternative to set the mood. I'm also sharing this video from Lifestyle Expert Brandi Milloy that she did for Cost Plus World Market. She shares her top tips on bringing indoor comforts outside. Weather-resistant pillows and rugs that look as good as they feel make decorating easy, and a versatile Veracruz Sectional lets you play with your seating setup. Accent tables and surprisingly soft vibrant rugs made from 100% recycled bottles add color and tie the entire space together, affordably. Read more .